I get first day jitters. This is a problem I've had since I was much younger and I know exactly what to expect. The walk to Patan Hospital, however, set a new bar for first day jitters. Dodging traffic of all kinds - cars, buses, tuk-tuks (three-wheeled cabs), cows, motorbikes - that had no regard for my, or their own, safety was like living a game of Frogger I did not sign up to play. Upon safely arriving, I was received by the Director of Pediatrics, Dr. Imran. Perpetually smiling, bearded, and jovial in demeanor, he lacks only spectacles to complete the Nepali Kris Kringle image. After briefly meeting with the faculty members staffing the ward and critical care units it was time to get to work. Where the walk into work was a study in contrasts, the PICU was comfortably familiar. Several of the patients stayed for the majority of my time there and I also got to experience longitudinal patient relationships. Unlike in the US, the families are removed from the unit for the morning, as the bulk of the clinical care takes place then and space is at a premium. After rounds, each family is met with separately by the attending and the house officer responsible for the patient in a consulting room. Updates are given, concerns are addressed, and questions are answered. At the end, the family writes down the major changes for the day, and physically signs a document stating they were present for this session. The staff explained to me that since instituting this policy, lawsuits have plummeted as miscommunication has been vastly reduced. Anecdotally the staff told me the families have really embraced this, valuing the one-on-one time with the primary house officer and attending, and bringing carefully-prepared questions. My time in Nepal has been many things: educational, cultural, and terrifying to name a few. I saw the house officers in critical care take ownership of the unit and their patients in a way that is truly inspirational, and I hope I can bring even a fraction of this ethos home with me. The establishment of planned, daily, private conferences with the attending and primary house officer benefited the families in a way that was intangible, but noticeably valuable even to a cultural outsider. 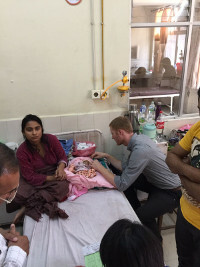 I look forward to a long life in international medicine, and I am lucky to have learned several powerful skills in Nepal to make myself a more effective global physician.